Area by San Elijo Hills being graded to pave way for Rancho Tesoro. 347-home Rancho Tesoro began to take shape this month between Cal State University San Marcos and San Elijo Hills at San Marcos. Meanwhile, 550-home Safari Highlands around Escondido was put on hold due to continued environmental concerns and the need for another round of reports. What once was pristine hiking turf broke ground this month for the newest masterplanned community. The first homes should be available for purchase next spring. 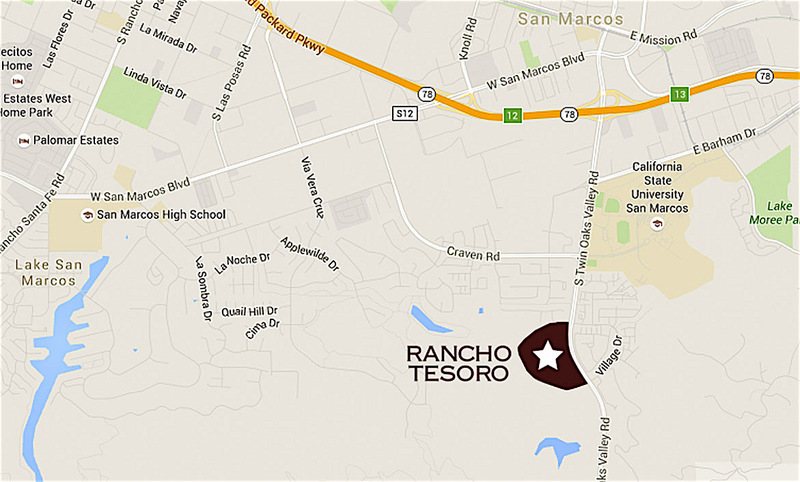 Called Rancho Tesoro, grading and land development efforts began to take shape near Twin Oaks Valley Road and Village Drive in San Marcos, according to Brookfield Residential, developing the 150-acre project along with California West Communities. Rancho Tesoro will feature four neighborhoods — three behind vehicular gates — each with unique architectural styles. The 347 detached homes will include private yards, four to five bedrooms, and two- to three-car garages. Homes will range in size from approximately 2,211-to-3,565-square-feet. Roadmap to San Marcos’ newest master-planned community. The community is located near Discovery Lake — which can be accessed through the extensive trail system — and is driving much of the nature-oriented design, officials said. “Future residents of Rancho Tesoro will enjoy a true front row seat to nature, as the community will include a direct connection to Discovery Lake for walking and biking, catch-and-release fishing, picnicking, enjoying playgrounds and more,” Mercedes Meserve, vice president of marketing for Brookfield Residential Southern California, said. “In addition to enjoying the community’s scenic location, residents will have easy access to all that the city has to offer, including high-performing schools within the San Marcos School District, as well as nearby Cal State University San Marcos,” Meserve said. Proposed private recreational amenities at Rancho Tesoro include a pool, barbecues, picnic tables, a covered trellis pavilion, neighborhood parks and access to multiple trails for walking, jogging and bicycling. The community is located south of State Route 78 and CSUSM,near San Elijo Hills. Visit LiveRanchoTesoro.com for more information and to join the interest list. March 29, 2015. Escondido, CA. USA.|Safari Highlands Ranch area of nearly 1,100 acres of vacant land east of Rancho San Pasqual, northeast of the Rancho Vistamonte Community and just north of the San Diego Zoo Safari Park. | Photos by Jamie Scott Lytle. Copyright. Controversial proposed seven neighborhood, 550-luxury home Safari Highlands will have to wait for at least a year as Concordia Homes plows through a massive draft environmental report. The new proposal faces many of the same challenges that stopped its predecessor. 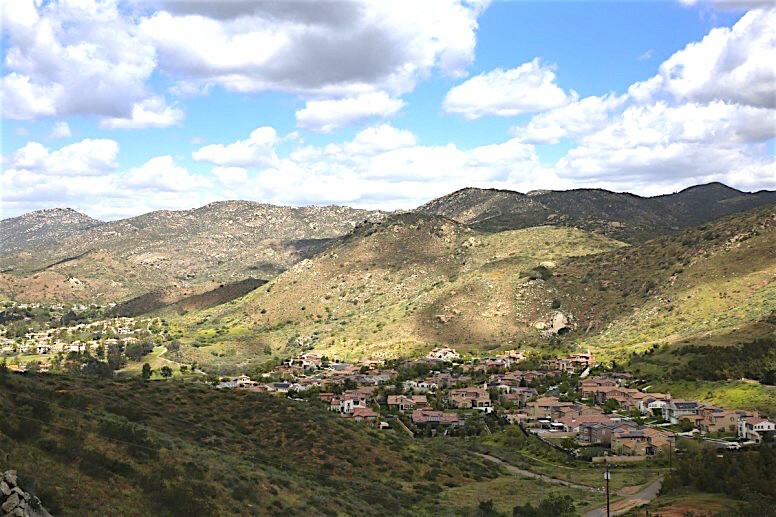 Concordia Communities LLC is proposing a 550-luxury home development, called Safari Highlands Ranch, on 350 acres of the empty, rugged property north of the safari park, northeast of the Rancho Vistamonte Community and east of Rancho San Pasqual. The property is currently part of the unincorp`orated county, where county law only allows 27 homes. So the developer is trying to persuade the Escondido City Council to annex the land. That would allow 550 homes and provide sewer, water and fire infrastructure that the county would not. Objections center around access toads, a new fire station, traffic concerns and the threat to peace and quiet enjoyed by current homeowners in the area. Martin said the city recently asked the company to drop plans to build a five-acre public park near the project’s entrance because Escondido won’t be able to adequately staff, program and maintain the park. The developer will instead have to pay the city a fee to satisfy its park and community benefit requirement. In 2003, the Escondido planning commission denied a different developer’s plan to build 403 homes, a 250-room resort hotel and an 18-hole golf course on the very same land. The developer pulled his proposal and sold the property. In order to go through the annexation, both the Escondido City Council and the Local Agency Formation Commission need to approve the change – a process that could take years. Be the first to comment on "Tale of two master-planned developments"